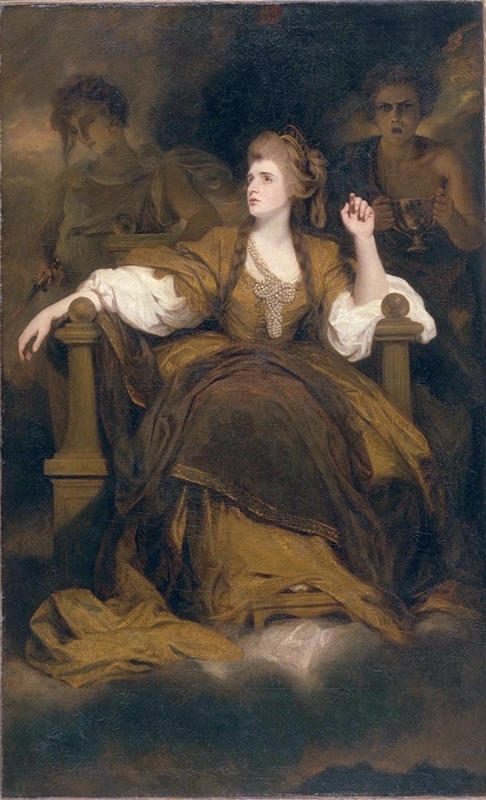 Born into the theatrical Kemble family, Sarah Siddons would attain iconic status as a tragedienne, although her parents initially discouraged her pursuit of a life on the stage. In her youth, she toured with her father’s company, making her first recorded appearance in 1766, in the role of Ariel in The Tempest. In 1773, she married the actor William Siddons and, shortly after, her talents were recognized by well-heeled individuals who referred her to connections in London, where she debuted in 1775. Her performance was dismal, however, and uniformly scorned by critics. Siddons retreated to provincial touring for the next six years. Her ascendancy as the greatest tragic actress of her age began in 1778, in Bath, and she made a triumphant return to the London stage in 1782. Through all of this, she bore five children in an increasingly unhappy marriage to a man who, by law, had control of her finances. Siddons brought a psychological depth to interpretations of tragic heroines—usually innocent women exploited and ruined by men—that resonated especially with female theatergoers, even a role as seemingly unsympathetic as Lady Macbeth, her greatest triumph (1785). Her blend of classical gesture and emotional intensity engendered delirious reactions in audiences and she mesmerized the theatergoing public well into the 1790s. After the turn of the nineteenth century, Siddons made increasingly fewer stage appearances, and officially retired in 1819.